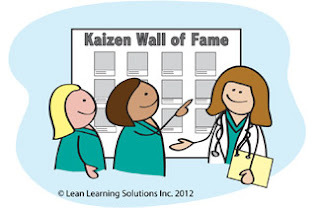 Lean Thinking: Why is Safety Foundational to Lean? Why is Safety Foundational to Lean? I’ve visited several organizations that have taken the traditional five areas of 5S and added a 6th S to them – Safety. I understand why they do this, as they are trying to highlight Safety as an important part of a Lean Transformation but I think it goes deeper than this. Let’s start off by asking what we mean by Safety. Safety is more than the physical safety of our employees. That’s just the beginning. Of course we don’t want anyone to get injured or have an accident at work but Safety in Lean goes far beyond that. We need to provide a workplace that is not only physically safe but emotionally safe as well. One where people don’t need to worry that their ideas may be ridiculed or fear that their boss will yell and get angry if they make a mistake or worse if they suggest something the boss doesn’t agree with. By providing our people with a working environment that is both physically and emotionally safe, we lay the foundation of a workplace where people are treated with dignity & respect. Respect for Humanity is one of the pillars of Lean along with Eliminating Waste and Continuous Improvement. It means engaging their brains as well as their bodies in the daily work of the organization. It means providing challenging problems that stretch people’s capabilities to solve and lead to huge learning. It means believing in the creative and innovative power that resides in every person. It means engaging people to their full potential and helping them become the best they can be. It’s a workplace where we engage people’s hearts and minds to help get a little bit better every day. We can only do this when we provide a workplace that is both physically & emotionally safe, where people don’t have to worry about their well-being and so can focus on the task at hand as well as making daily improvements in the way we do the work. Paul O’Neill, former Secretary of the Treasury and former Chairman and CEO of Alcoa used Safety as a window on the process to drive improvements and make Alcoa the industrial giant they are today. He understood that Safety was foundational to engaging people in improvement. He is now leading a charge to do the same thing in Healthcare.